Selling Italy as somewhere you have to go is easy, if you’re human and have a heart then it’s for you. The only tricky part is choosing where exactly in Italy to visit. In an ideal world you could take a few months off work and explore every inch but alas, few of us live in such a world and so it’s all about picking the area that speaks most to you. Two of the most well-loved areas of Italy are Sicily and Sardinia, both excellent representations of the wonders to be found in Italy and yet both offering a different flavour. The choice between them is tough, but with any luck you won’t visit Italy just the once, so this is more about choosing which first rather than either or. To help, we present Sardinia and Sicily, the scintillating sisters of Italy you have to see to believe. If you were to personify Sardinia, she’d be strolling up to you with a backpack slung over one shoulder, walking boots on her feet and likely as not leading a horse behind her ready for a hack along some gorgeous coastal bridle-path. 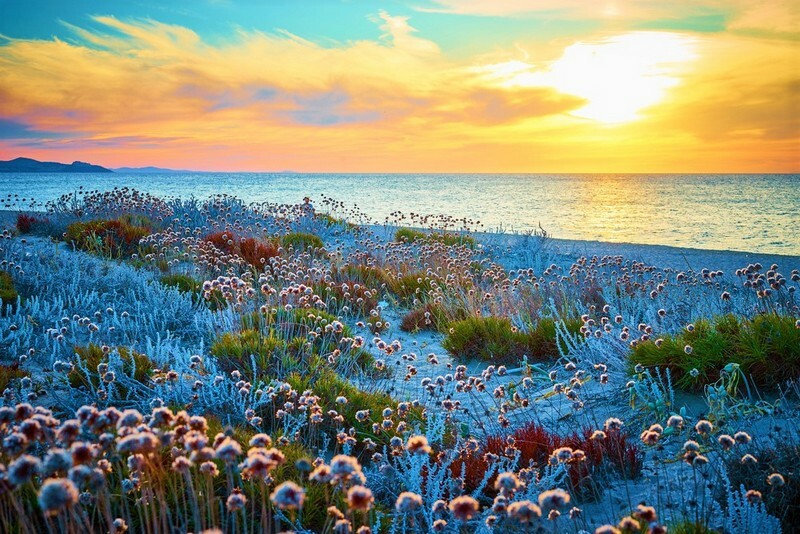 Sardinia is where you go for wild Italy, for flora, fauna, and fun. It’s an untamed wilderness playing host to some wonderful wildlife and astounding scenery. 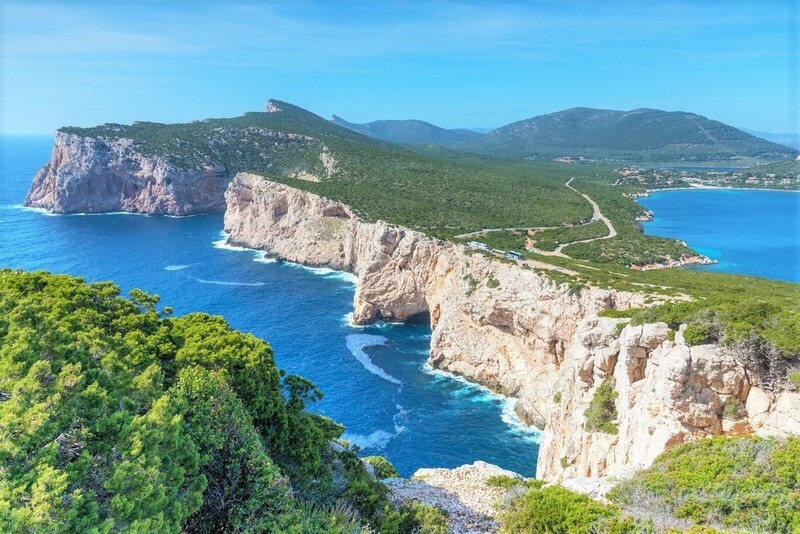 From exploring caves to strolling along the Emerald coast or ambling through historic sites, Sardinia is the sister that makes you look around and wish you had an extra pair of eyes. As we’ve said, if you love animals and greenery, you couldn’t pick better than Sardinia, but there’s also a rich history, great food, and fabulous museums to also draw you in. We’ve listed just a few things you should put on your list, you’ll discover when you arrive that there’s many more. Perhaps one of the most well-known tourist attractions when it comes to nature are the albino donkeys of Asinara, a little island just off the west coast of Sardinia. These beautiful animals, rumoured to be descendants of Egyptian stock, are indigenous to the area and you’re able to visit them via a selection of tours including biking and walking. Elsewhere in Giara di Gesturi, there is also the opportunity to see yet more delights of the hoofed kind, with wild horses roaming among the cork trees in vast herds. Whether walking or biking, there are few experiences so humbling as watching these quietly majestic animals going about their business free of fence or reign. For something a little more historical, a visit to the Cittadella dei Musei is sure to be a winner. The range of archaeological artifacts dates back thousands of years, right back to early Neolithic and beyond to the Bronze, Iron and Phoenician periods. From sculptures and figurines to vases and jewellery, the mythical and mysterious past of Sardinia is written within these walls. Off to the northeast now is yet another natural wonder, the Olivastri Millenari di Santo Baltolu. This nature reserve is the home of olive trees that have been growing for millennia, the largest of which (coming in at 14.5m tall) estimated to be roughly 3,800 years old. For less than a cup of coffee, you can stand beneath these Tolkienesque wonders and not only feel more like a hobbit than you’ve probably ever felt in your life but also a deep sense of awe at these magnificent and ancient specimens. For yet more magical sights, you need only head to Santadi, and visit the Grotte Is Zuddas, one of the most beautiful caves you’re likely to come across and seemingly a favourite among frequent cave explorers. The four-hour tour will typically start and end on the Chia-Teulada street, notably used by the ancient Romans, and once you descend you’ll be faced with the beautiful naturally formed stalactites and stalagmites that make up the stunning interior. Su Nuraxi sits at the foot of Parco della Giara and is made up of domed historical edifices that are estimated to have been created in the twelfth century BC. This fantastically preserved site is shrouded in mystery, with experts not really sure what went on here, were these temples? Places to meet? Military bases? Whatever they were the tours you can be taken on are fascinating and not to be missed. 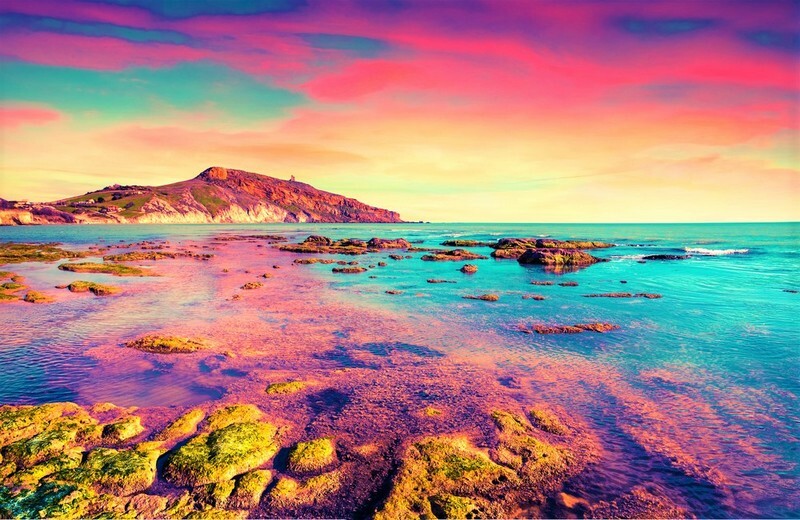 As we said, Sardinia is a little island that’s bursting with magic and beauty no matter where you wander, so please do wander and discover all this and much more. You’ve met Sardinia of course, all flowers in her hair and ponies in her wake, but it’s high-time you met her sister, Sicily. Sicily is the street-smart one who undoubtedly shows up with a camera in one hand, sunglasses in the other and her sights set on a cool glass of wine and an amble around a street-market. 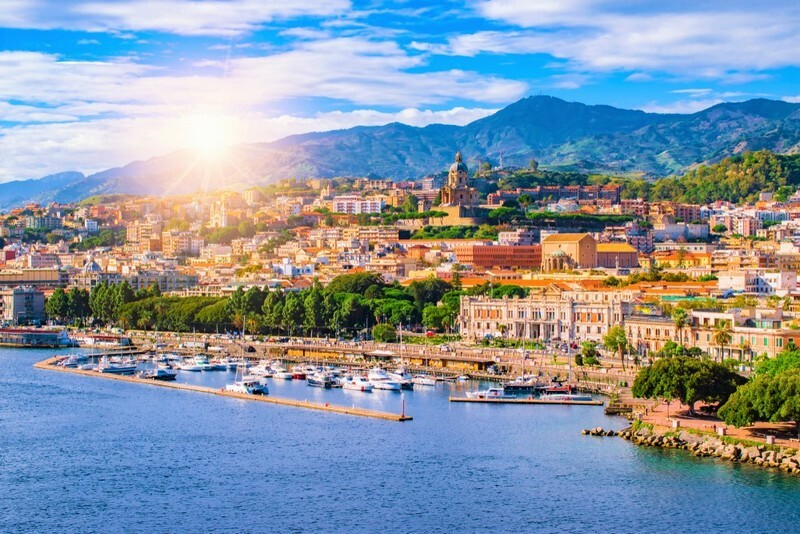 Sicily is still just as beautiful as Sardinia, and equally as steeped in culture and history, but you’ll notice that there’s a livelier ethos about the place. For one thing, rather than the wide-open spaces and rural delights afforded her sister, Sicily’s beauty comes in the form of cobbled streets, bustling shops, stunning beaches and ending the day watching the sunset over the harbour, cocktail in hand. It’s a colourful, diverse and intriguing island and many who visit come away saying it encompasses everything that is Italian. Once again, our list isn’t exhaustive, but we hope it will at least set your curiosity in motion. 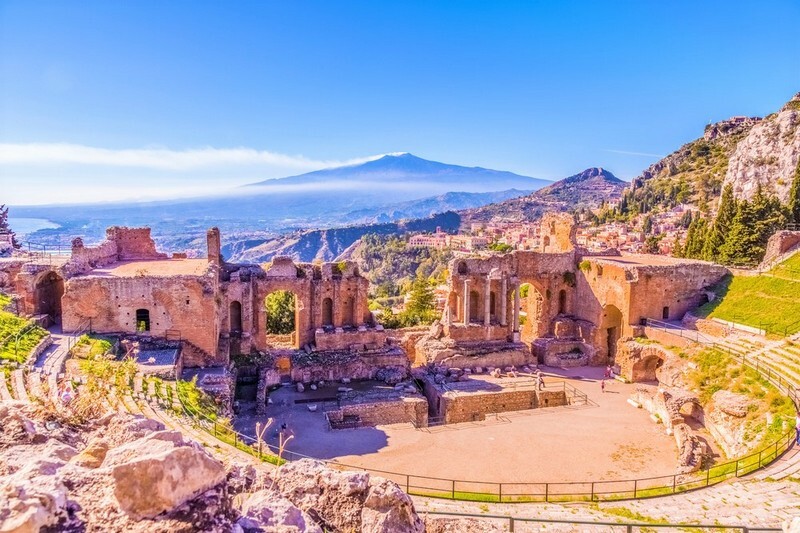 One of the great things to visit in Sicily is the Ancient Theatre of Taormina, a wonderfully preserved amphitheater that is estimated to have been created by the Greeks in the third century BC but was later adapted by the Romans. It’s an amazing sight to behold and even holds performances today, including the likes of rock-band Kasabian! There are a plethora of bars to be found in Sicily of course, but this just happens to be a favourite of ours. Stroll in and you’ll be met with friendly faces and a trendy atmosphere. Take a seat and someone will come and ask you about your cocktail tastes before slinking off to do what these guys do best: mix! Sicily is the home of Europe’s largest active volcano, the majestic Mount Etna which has been drawing in travellers for decades. Fascinating and beautiful in equal measure, you can take a variety of group or private tours to this incredible site and get a taste of nature up close. Ah shopping, if ever there was a good place to treat yourself this was it. You’ll find the standard places if you go looking, but who travels to find typical? If you want authentic shopping then you need to go for events like the craft and antique market at Mascalucìa, held on the second weekend of each month, or the Palermo market where you can pick up some glorious local food produce. There are plenty of beautiful beaches to lounge on or to visit the ever-popular attraction of turtles, but one of the continually popular picks in Sicily is San Vito lo Capo. It’s got beautiful white sand and a laid-back feel and it even plays host to an annual Couscous Festival! What’s not to love? No matter what you want, there’ll be some part of Italy that can provide and Sardinia and Sicily are two of the most rewarding places. Our advice is this: no matter which one appeals more to you, visit both, they may be chalk and cheese in some respects but they also never disappoint. Want to see the rest of Italy? Here are our villas in Italy.